The former French-trained gelding was having his first run for Lambourn handler Joe Tuite, who admitted he almost quit the game two years ago as he had a stable of sick horses and just a handful of winners. Described as "delicate" by Tuite, Litigant (33-1) - a winner on All-Weather Championships Finals Day at Lingfield last year when with Seamus Durack - had to be as strong as an ox to claim one of Europe's richest and most prized handicaps. After giving jockey Oisin Murphy a scare at the stalls, the seven-year-old stormed to the head of affairs after Fields Of Athenry had continued the hectic gallop earlier set by John Reel. Running on strongly, Litigant had a length and a half in hand of the Willie Mullins-trained Wicklow Brave, with Suegioo another neck away in third and Toe The Line fourth. 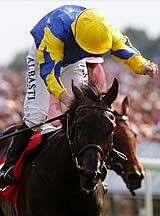 Murphy said: "I take my hat off to Joe Tuite, because I worked this horse a few times and he wouldn't work to 60. "But Joe said keep the faith, with a bit of ease in the ground he's a different horse - I must say he's bolted up today. "They went a good gallop, but he's got enough class. In fairness to George Baker, he told me this is a Group horse, obviously having had so few runs and been off for so long it's hard to see it but he was proved right." Tuite, former assistant to Mick Channon, said: "That was superb. I'm speechless. It's a marvellous team performance. "They've worked unbelievably hard to get this horse back to the track. He's very delicate. "We've had a few quid on and we've dreamed it. We know he's very good when he comes right. "Two years ago I nearly walked away. I had sick horses and had just five winners in my third season. I was very close to packing it in. Horses can do that to you sometimes, but we had faith. We tried to do it right. "We had a good year last year and we nearly won the Super Sprint this year, but I'll take this instead. You go in the history books if you win this. This is a legends race and he's won it from nearly 500 days off the track." He went on: "He's a very good horse and has only been beaten twice in his career. "I'm a lucky man that Tony (Byrne) sent this horse to me. "We've got to look at the two-miler on Champions Day at Ascot now." Proud owner Byrne said: "Two furlongs out I knew we'd got it. To bring him back after 491 days off to win this is some achievement." For his troubles, Murphy picked up a four-day ban (September 6-9) for using his whip above the permitted level, while Wicklow Brave's rider Jack Kennedy got nine days (September 5-13) for a similar offence. He was also fined £350. Mullins said: "I was a bit disappointed with Clondaw Warrior (12th). He's had a lot of racing and maybe it's taken its toll. "But Wicklow Brave ran a cracker. I don't know what we'll do next. "We'll go home and think about it."